As rumors circulate that the Rangers may pursue the next round of the fire sale sooner rather than later, the blue line becomes an area of particular focus. Returning most of last year’s defense, the much maligned blue line has been seemingly unable to stop anything the past few years. While it is expected that the club will be better defensively as they adapt to the new system, there will need to be some personnel changes. 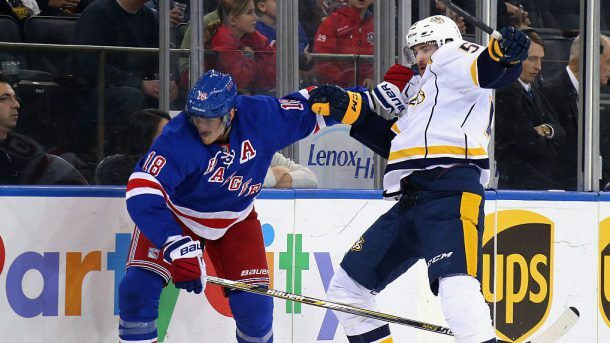 Marc Staal is the main target here, but players like Adam McQuaid, Brendan Smith, and Kevin Shattenkirk may also be on their way out. However, that may not be as quick as some might prefer. The key to a rebuild is developing youth and ensuring they aren’t rushed. Until those kids are ready for the next level, the Rangers need bodies at the NHL level to eat minutes. Say what you want about any of the four veterans above, they, at the very least, eat minutes and ensure the prospects acquired at least year’s deadline aren’t rushed to the NHL. There is certainly an argument for making a trade sooner rather than later. It will open up consistent playing time for someone like Tony DeAngelo, who is at his own crossroads. But beyond that, there is value in players eating minutes. Until some of the other kids are ready to take that next step, the Blueshirts need bodies. But have no fear. The blue line rebuild will eventually come. It just might not be as immediate as the forward rebuild. Oh it’s coming, no doubt about that. Personally prefer keeping Shattenkirk around as the elder statesman as opposed to Staal. Besides, the right side isn’t quite as overloaded as the left and it appears that Hajek is close to ready. If there’s any interest in Staal I would eat half his K and ship him out for a prospect or decent draft choice(s). Ha, seriously? I’m alone in thinking that Hajek looked quite good in camp? No not at all Tanto I watched all the preseason games and I thought the Hajek/McQuaid pairing looked the most ready to go. I would keep Shattenkirk and Smith. They’ve played well together and I think they could be the two veterans on defense. Trade McQuaid, buy out Staal and let the young guys fight for the rest of the spots. What’s with the negativity towards McQuad? Big defenseman in front of Hank has been needed for long time. There would be less negativity around McQuaid if he wasn’t a 32 year old on the downside of his career who plays instead if younger players who need to be developed. I get it that he clears the crease and can fight. But his overall game is mediocre and when he plays DeAngelo and Claesson usually sit. Two attributes the Rangers will need if he is moved. Especially, when the youngsters get to the show and the coach is leaning on them to play with some jam. It’s going to be a while. And it will be a slow turnover. I am a little concerned with how Quinn is deploying these guys. I think ADA has made strides and even played OK, yet he spends most nights on the bench. Staal and McQuaid may be bodies to eat minutes but they should be eating less minutes, as evidenced by their play. As for the future, unless things change dramatically we looking at a top 5 draft pick in 2019. There are some quality D men in this draft, but the top 5 picks will most likely be forwards as the talent level of forwards in this draft will be exceptional. Philip Broberg and Bowen Bryam are probably the 2 best D men in the draft at this point, but if we get a top 5 the forwards are too good to pass up and reach for one of those guys. We really need to figure out a way to get another pick in the top 10 to 15. Victor Soderstrom is another guy we can target later on round 1. (like mid round) But these guys will also be a few years away from really competing. I can’t see anyway you can trade Staal. Even with salary retention. There is no point in buying him out. We probably won’t be competitive until after his contract expires. I would rather have him in the press box then paying part of his salary for the next 6 to 8 years in a buyout penalty. We should be able to move Smith but most likely will need to retain some salary. McQuaid should be gone by the trade deadline. Shattenkirk is a funny one. I think he’s value is definitely not as good as you would hope. He’s not been great since he came over and he had a soft play off run with The Caps a few years back. I’d be more inclined to keep him, but if someone offered something really good I’d let him go. K’Andre Miller is having a great start to his college career and Nils Lundkvist also having a decent start to his SHL career but again both are a few years away. Hajek and Lindgren are the best shot at reinforcements in the near team. But it’s not reasonable to think these guys will come up and everything changes over night. It’s going to take more patience than me probably think for us to have a solid D again.